Thank you so much for adding to my knowledge about garlic. I have way too much of it this year, because. . .well. . .it's such an ugly story. The guy who first brought garlic out here to plant told me when I dig it up, I should lay it out to dry in a shady, protected spot (out of the sun, out of the rain). I thought: open machine shed. Worked fine the first year. (He says lay it out for a couple of weeks, then cut the stems down to about 8 inches, dry another couple of weeks, then cut one more time down to an inch or so.) But last year, during the first drying period, some started to disappear. Well, turns out the pack rats like garlic. (Who knew?) They hauled off 1/3 of my crop, and kinda' left me not too hungry for the rest of it that they had walked over and nibbled on. (Funny that way, I am!) So. . .I just planted it all! Yep, all 300 cloves! Did I mention that I live alone? And while of course I like garlic, there is a definite limit to what I can consume. 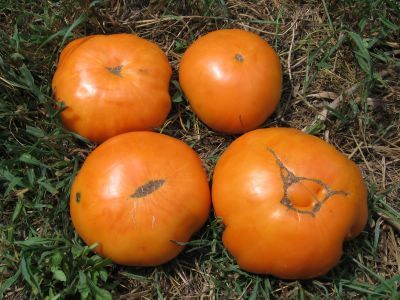 I had some that did really well and so I am saving that for planting this fall, and am just struggling with some that will definitely not store worth a hoot. Someone suggested that I could store it in olive oil. Sound like a plan? Thanks again! Sorry to be so wordy. I'm just long-winded - could be that living alone thing, am not sure. I don't understand the interest in eating raw zucchini - don't you find it to have an odd texture/tackiness - kind of sticky or astringent or something? I can never quite label it correctly - just something - distasteful. But I do love it cooked! The salad looks like it could almost make an equally good salsa with just a slightly finer chop! Now I'm worried. I started Kellog's breakfast from seed indoors but they died during hardening. So around the end of May I direct seeded 1 seed outside which is now 1 big plant with several small green fruit. Our first frost date ranges anywhere from Sept 1-October 30th. I think I'm going to need some epsom salts to speed up the ripening process. You've almost invented panzanella! It's an Italian salad. Add some stale bread (traditionally just the white part) soaked in water and squeezed out. It will soak up the the excess liquid and absorb some of the vinaigrette taste. Sourdough works really nicely. Love your blog. Many thanks for all your sharing! I made this! I also threw in some cold, leftover couscous and cut the kernels off of 2 leftover grilled corns on the cob and added them too. It was very yummy! I also made the dreaded mistake of making your beer bread with guiness. It was inedible. Do you recommend a light beer for that recipe instead? Wow...I always thought when tomatoes were "marked" like the one on the bottom right, or somewhat "quartered off" that I had done something wrong growing the tomatoes. This isn't so, then? What causes those marks on the bottom, anyway? And what causes tomatoes to "gather in the middle" causing kind of that "quartered" effect instead of them being perfect and round? Hey, sign me up for one of these. It sounds great. I already told Alanna I've never heard of this type of yellow tomato before. They're almost orange, I love the color. 1. I owe you a lifetime for encouraging me to try Heirloom tomatoes. I've seen them in the stores, but never had the courage to taste them--until now. When I was chopping up my Heirlooms (yellow and orange) for the salad, I ate a piece for the first time...and then had to physically restrain myself from putting my FACE IN THE BOWL. Holy TOLEDO are those good tomatoes! 3. I didn't have garbanzos, so I added black beans instead. And then I liked the Spanish effect--even though I had already added the Italian dressing--so I added both chili flakes and a TINY pinch of cayenne pepper. The spoon I licked off tasted, again, so good that I almost put my face in the bowl, but I'm waiting. Update: I had a bite of my salad. And then I had many, many more bites. In fact, mmmph, mmmph, chew, chew--I'm still eating! YUM! 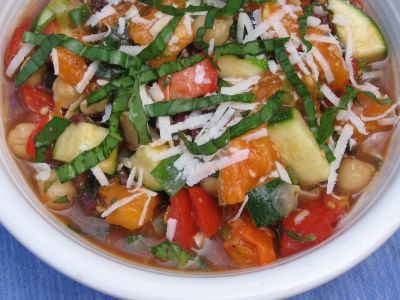 Summer in a bowl - what an abosolutely perfect description. This looks heavenly. Isn't it awful when certain plants just won't thrive for you? I tried to grow eggplants this year..what a disaster! I have had disaster on some tomato but I truly believe it was more the weathers fault..at least that is what I want to think. Great blog adn amazing dishes. Way to go mate great contribution to us foodies. I have been growing Kelloggs Breakfast for 4 years now. Zone 5 Colorado Springs. 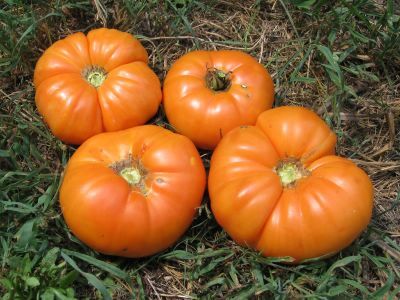 They are wonderful, thick meaty sweet flesh very few seeds and bright yellowish orange. Starting them from seed is tricky they always look weak an small compared to the other seedlings. Don't give up, plant them in the garden anyway they will catch up with the others and provide you with fantastic fruit. Last year for some reason they were my first ripe tomato (large variety).